That young man's name was Charles Darwin. His geologic observations and his distinctly uniformitarian interpretation of the valley later impacted the world greatly. The 200th anniversary of Darwin's birth is being celebrated this year. I wanted to see what Darwin saw, and I wanted to understand why he generated the decidedly uniformitarian understanding of this river valley. So I visited his original campsite. What I saw at Camp Darwin utterly shocked me. I saw abundant evidence for a colossal flood that must have rapidly performed significant erosion in the valley. I used Charles Darwin's description of the valley to find the campsite on the Santa Cruz River in southern Argentina. Darwin's journal and science paper are very explicit regarding the location of the site. 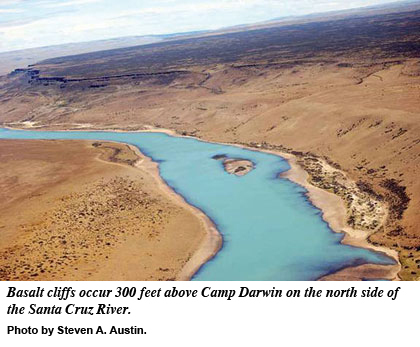 Camp Darwin occurs at 280 feet elevation on the north bank of the Santa Cruz River, within a two-mile-wide narrowing of the wider valley, and beneath basalt cliffs. Darwin correctly observed that the modern river was moving just sand and pebbles. But he did not find a location where the river touches the basalt cliff. Everywhere in the valley, cobbles and boulders on the floodplain separate the present river bank from the solid-rock cliffs. It is obvious that the minor power of the present river is not moving boulders, so the present river cannot be eroding the cliffs. Only a big flood could sweep away the cobbles and boulders 50 feet deep below the river bed, and as wide as the valley, to erode the basalt. Darwin erred significantly in linking the modern river's process with the ancient erosion structure. Darwin described the narrow section of the valley of the Santa Cruz River as providing evidence that the basalt strata on both sides of the valley were united before somewhat less than 300 feet of erosion occurred, producing the two-mile-wide gap. I found the basalt stratum in the prominent cliff on the north side of the river. Darwin had correctly identified it. 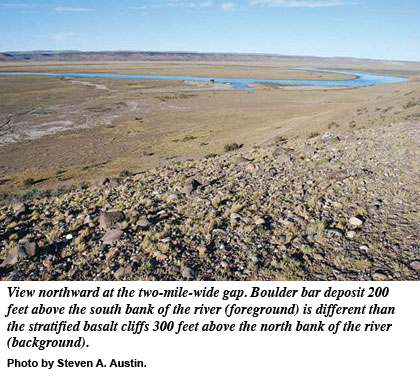 However, no basalt stratum occurs on the south side of the river. The ridge on the south side of the valley is a gigantic depositional bar composed mostly of large redeposited basalt boulders and cobbles. Darwin misidentified the southern ridge as a volcanic stratum cooled in situ from a lava flow. The bouldery ridge is 200 feet high, three miles wide across the valley's south side, and five miles long extending down the valley. Watermelon-size basalt boulders within the ridge were eroded from the upstream area and redeposited on top of the gigantic, 200-foot-high, transverse bar. The size and scale of this boulder deposit stagger the imagination. The flood of water had to greatly exceed 200 feet in depth and extend the whole six-mile width of the valley! Therefore, the Santa Cruz River valley must be the spillway from a gigantic flood. Large boulders occur on top of the basalt cliff on the north side of the river. Darwin described one as being 15 feet in diameter.2 According to Darwin, flowing water could not move such big rocks. Water, according to Darwin, could not sweep a boulder 300 feet above the present level of the modern river to the top of a cliff. Therefore, Darwin assumed the big boulder was dropped from a melting iceberg when an ocean stood over the basalt. Again, Darwin was significantly in error. The cobbles and boulders overlying the basalt at the cliff top are the spillover deposit accumulated rapidly when the flood exceeded the depth of the valley. Therefore, the colossal flood was likely 400 feet deep across the entire six-mile-wide valley! Why was Darwin so wrong concerning his interpretation of the river valley? First, he had expectations about what he would see at Camp Darwin before he arrived. His scientific judgment was tainted by preconceptions. Second, Darwin was reading the wrong book before his journey up the Santa Cruz River valley. He had been reading Charles Lyell's book Principles of Geology (1830) during his trans-Atlantic voyage on the Beagle. That book gave him the idea that the biggest boulders were deposited from melting icebergs. Third, Darwin was developing a new, woefully inadequate methodology for dealing with the world. He saw the structure of the present valley and understood it to have been formed by the continued slow action of the modern river during the lapse of great geologic ages. Later, Darwin revisited the bogus methodology when he assumed that beaks of finches on the Galapagos were derived slowly during geologic ages from a common bird by the cumulative process called natural selection. Darwin was in error about the Santa Cruz River valley. What if young Darwin had correctly interpreted the colossal flood evidences within the valley? Would he have later entertained that biological extrapolation called biological evolution? It is evident that Darwin became a committed geological evolutionist before he became a biological evolutionist. Camp Darwin marks this young naturalist’s first scientific wrong turn. Darwin, C. 1839. Voyage of the Beagle. London: Smith, Elder. Quoting from chapter 9 under the entry dated April 26, 1834. Darwin, C. 1842. On the distribution of the erratic boulders and on the contemporaneous unstratified deposits of South America. Transactions of the Geological Society of London. 6: 415-432. Adapted from Dr. Austin's article "Camp Darwin Revisited." * Dr. Austin is a geological consultant for the National Creation Science Foundation. Cite this article: Austin, S. A. 2009. Darwin's First Wrong Turn. Acts & Facts. 38 (2): 26.